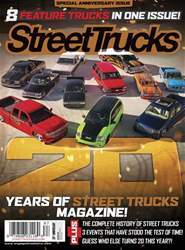 IT FEELS WEIRD TO WRITE ABOUT MYSELF SINCE I’M USUALLY WRITING ABOUT ALL OF YOU, BUT I WAS ASKED TO TELL YOU GUYS ABOUT MY HISTORY WITH “STREET TRUCKS,” SO HERE GOES! I’m lying here with a sore back underneath one of my latest projects, about to slip in a set of lowering blocks. Then it hits me: This is how it all started for me— with a set of lowering blocks, lying underneath a truck, albeit minus the sore back. The first time I did this I was 16, and I had just bought my first mini-truck after seeing a local mini-truck club cruise up to the In-N-Out down the street. I. HAD. TO. LOWER. MY. TRUCK. A quick trip to Pep Boys for some supplies and I was well on my way!